Just when the Lucerne Festival was starting to lose its joie de vivre, Vladimir Ashkenazy and the Sydney Symphony Orchestra dropped into town and happily lifted the spirits of all but four of the packed house who left the celebration of Tchaikovsky even before the patiently-waiting organist put the icing on the orchestral cake during the last few minutes of the Manfred Symphony. 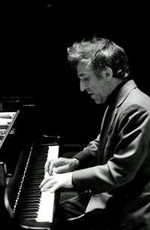 To borrow an increasingly tired political cliché, let’s be clear: Ashkenazy’s stilted baton technique and point-by-number left hand cause more problems than they cure, BUT his entire being’s obvious love for every note on the page, every musician on stage and every patron (whether or not they made it to final double bar) communicates so readily that it’s a real pleasure to share a couple of hours with a veteran artist who used to be one of the finest pianists on the planet (cross-reference below). Two of the three works of the program worked to his delight and the audience’s advantage. The three-movement, frequently-revised Rakastava (beginning life as a choral work but likely chosen as it’s title “The Lover” fits in well with the Festival’s theme of Eros) played here by reduced strings, tympani and a few triangle strokes, seemed a most curious choice to “show off” an orchestra as it struts its stuff around Europe. (Next stop is the BBC Proms where Hélène Grimaud continues with the orchestra, this time performing Ravel’s Piano Concerto in G.) Yet the time slipped readily by and the players gave nearly everyone in the room their first glimpse at an admittedly slight work (compared to the composer’s tome), but isn’t a bit of novelty just the stuff of which festivals are made? Tchaikovsky’s unnumbered symphony was a wonderfully-melodramatic showpiece that allowed the musicians to demonstrate their skills (kudos to the bass clarinetist, principal oboist and tambourine-percussionist) and indulge the intrepid maestro with wave after wave of hair-raising bombast and a weepy theme that just cried out for—and dutifully received—copious amounts of juicy portamento. To be sure, each successive movement was less intense and crisp—fatigue seemed to set in to the point where the harps were cut loose and allowed to fend for themselves. Maddeningly, (compared to the previous evening’s muted pipes in Elijah) when the organ had its chance to shine, a few francs more were required to pump up the volume meter to match the Aussies at full blast. Here’s hoping Copland’s Organ Symphony in a couple of weeks will fully reveal the capabilities of that towering instrument. Beethoven’s final piano concerto was a disappointment on nearly every front. Not one of the important piano (Grimaud as soloist) and orchestra link-ups were together. Oh for the heady days of Emil Gilels and George Szell where the combined effect was like opening the door of a chord already in progress! Quick, rarely-steady tempi never settled, producing all kinds of excitement but none that Beethoven intended. The incredibly well-structured middle movement largely ignored the harmonic underpinnings, producing poetry without motion.